AN HITACHI Intercity Express has arrived at Newquay on the north coast of Cornwall for the first time. The gauging run from Bristol ended successfully at 11.17, when the nine-car Class 802 came to a stand at Newquay in preparation for the holiday season next year. 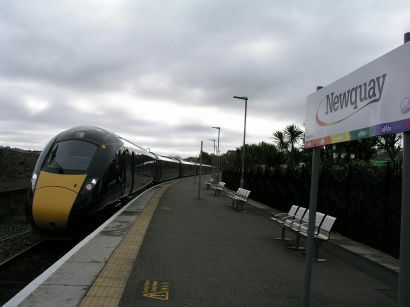 Through intercity trains run to Newquay between May and September, and the Great Western services from London Paddington have been worked by HSTs since 1987. These veteran trains are now being withdrawn in favour of Intercity Expresses, and today’s run was to test clearances on the 32km branch, which is mostly single track. One problem emerged during the trial. If ten-car trains are used, two of them would be unable to pass at the line’s principal intermediate crossing place because the loop, at Goonbarrow Junction, is slightly too short, but careful allocation of sets for Newquay services is expected to be the answer. The gauging team were otherwise pleased with the results of the special run, and have returned with detailed data to Stoke Gifford depot on the outskirts of Bristol. The first IET is now set to run in service between London and Newquay in May 2019.